Limited quantities and colors available. Great Kwik Step design with Kwik Klip buckles, nickel hardware and soft PVC-coated foam rubber padding at the contact points. Has decorative paw prints. The harness is designed to make it easy to get your pet into his harness. The flexible design features size chest and abdominal adjustments, so getting the ideal fit is easy! Just place the harness on the floor. 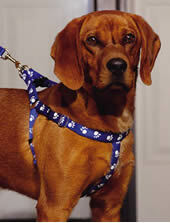 Put your pet's front paws in the harness. Pull up the ends and snap them tight. That's all there is to it. For proper sizing, measure pet around the chest (just behind front legs). The girth: the circumference of your pet just behind the front legs where your pets chest is the deepest (the rib-cage). The best way to measure your pet for a pet harness is to use a soft flexible measuring tape. If you do not have a soft measuring tape, you can use a piece of string, and then measure the string with a rigid ruler.